First you’ll want to find a galvanized bucket–the older the better. This one has been around forever, so it has a nice vintage look to it. For painting on FRESH I simply used acrylic black paint and letter stamps, which are from Michael’s but I don’t believe they sell these exact ones any longer. 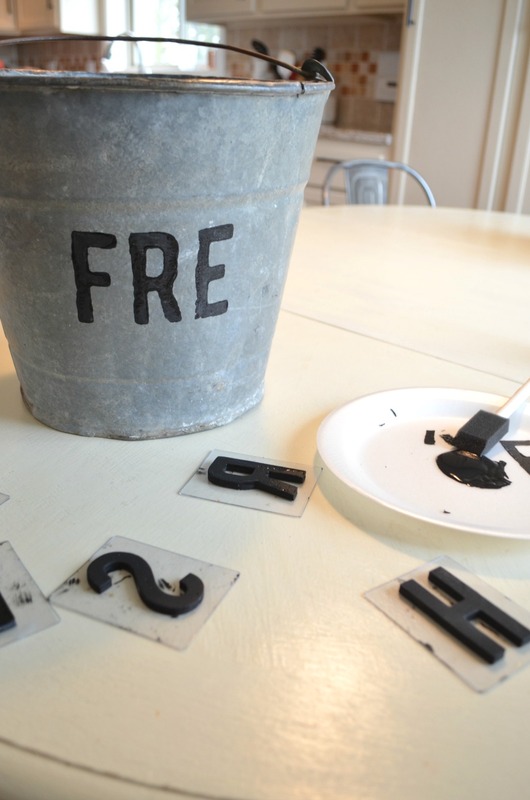 You could also use alphabet stencils, or even better just print out letters in Word, trace them on the bucket and fill in with paint. I’ve done that same technique many times and it works really well. (You can see it done in this post.) Either way, it only takes a few minutes and you’re done! Now for the flowers. I have to show you guys a really quick trick I do to make my faux flowers look bigger and more full. Start with any large bundle of flowers. These are from Michael’s and they’re a good size, buy if you were to just put them in the bucket as is, it would topple over to it’s side and wouldn’t look very full. You’d probably need 3 or 4 of these bundles to fill out the bucket I’m using. So instead of buying more, I cut each stem off the bundle. Just snip it right down at the base of the bundle. And FYI, you’ll need to use something stronger than scissors to do this because they usually have a wire in them. Ok, so once you’ve done that you’ll have a whole bunch of individual stems, which will fill out the bucket much better. 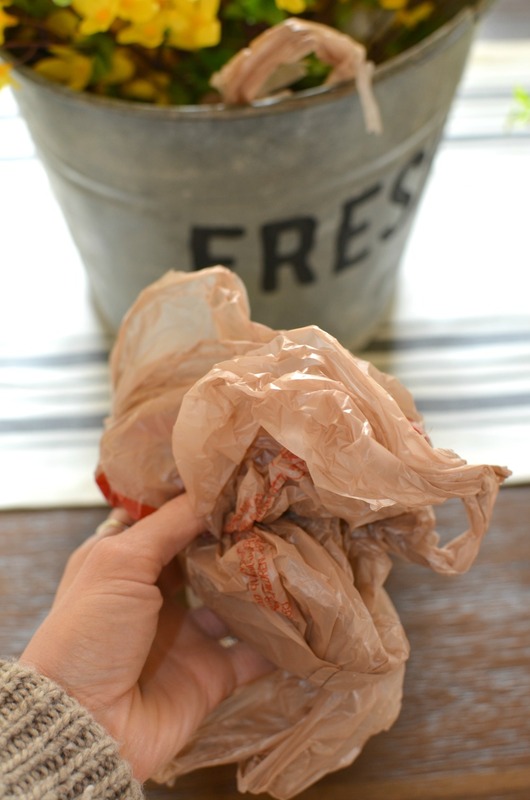 But here’s one more trick to make it look a bit fuller–use plastic bags! Yep, just grab a handful of those plastic bags you’ve been saving from the grocery store and start stuffing them in the bucket. I put the bags on the outer ring of the bucket, instead of directly in the middle. This will help hold up the flowers and give them something to “lay” on, which makes them appear fuller. I only needed two bundles of flowers to fill out this bucket. 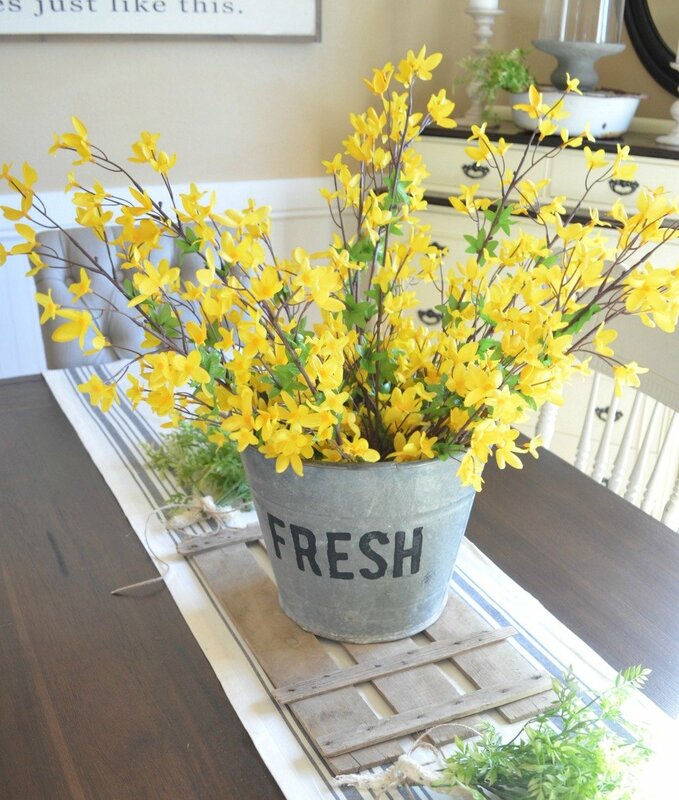 I do this trick alllllll the time with faux flowers in containers like this. Works like a charm! What is it about flowers that make a whole room feel bright and happy? It’s like magic. And I have to say, even though I love me some real daisies or maybe even tulips from time to time, these faux flowers work just as well AND they stay pretty forever–which is a huge win in my book. This whole room just comes alive with the pop of color. And by the way, have I mentioned that I’m ready for spring? I’m so happy with how this little project turned out and I can’t wait to use this “fresh” bucket all spring and summer long. I’d love to hear what you think and definitely let me know if you have any questions. Oh and tell me if you’ve ever done the plastic bag trick. Surely I’m not the only one stuffing Target bags in with their flowers! That’s a great tip. I’m curious to know how many bundles you actually used to fill the bucket. It looks really full so I’m guessing you used more then just one. 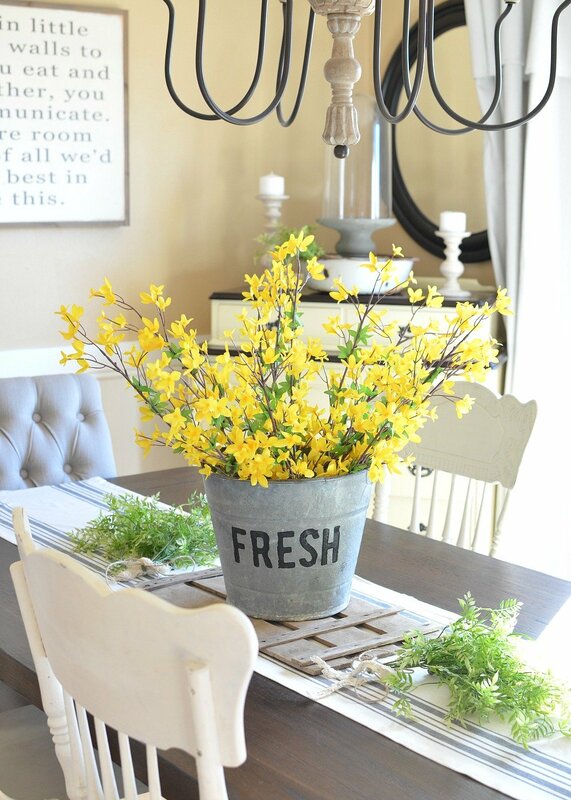 Love the bright pop of color the forsythia adds. Very Springy! Good question Lisa! I used two bundles of flowers to fill the bucket up. Thanks for dropping by! You’re so right, Sarah – flowers are like magic to brighten up a room. 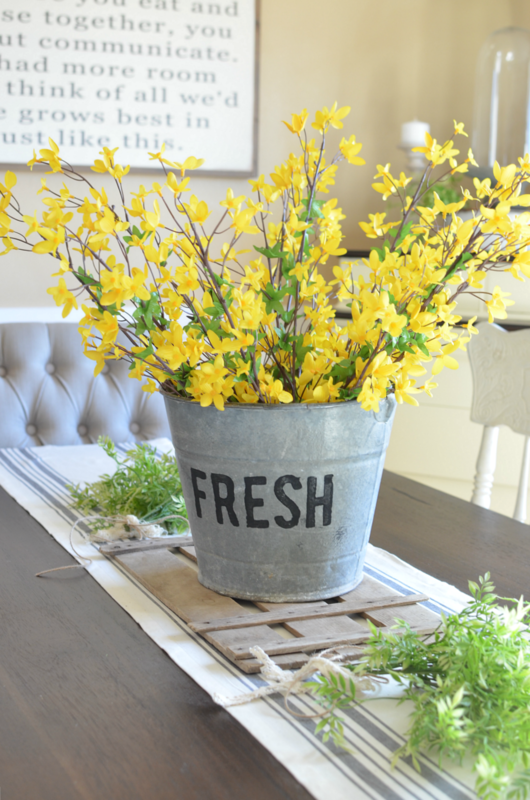 And I happen to have a perfect bucket to use for your “fresh” idea – so cute! Right JoAnne??! Magic little stems of happiness. I need a bucket of flowers in every room! What an awesome trick with the bags! I just subscribed to your blog a couple months ago and I absolutely LOVE it! Thanks for sharing with us! Sarah, so cute! I often put the stem pieces that I cut off in the bottom of the bucket along with the bags to help secure the stems. You can find new ones at farm supply stores. Old ones may be found at antique stores. I’m pretty sure I’ve seen a method on Pinterest for aging new galvanized buckets/tubs. Good luck! Hi Debbie! Great question. You can find buckets like this at tool stores, or even on Craigslist–the older the better! Just search for galvanized bucket and I bet you will find a few. Love your blog! I also love your table runner! is it possible to list the source? My apologies if you have already listed it somewhere else on your blog!! Of course, I should have listed the sources, thanks for the reminder! You can find that runner at World Market, here’s the link: https://rstyle.me/n/cfb7i9b6hgf. Thanks for dropping by Kimberly! Great Idea Sarah, my hubby got me 2 pots of Tulips for Valentines so spring has arrived.???? 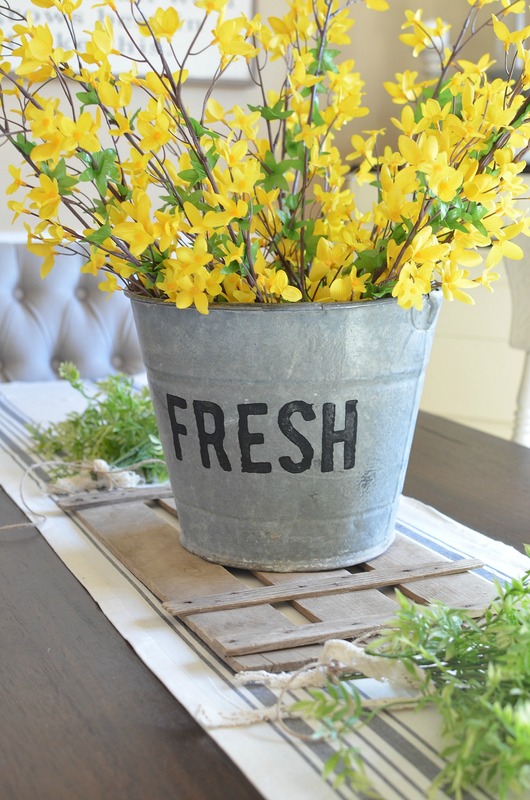 I am going to make a crate lid for my table cute idea. Just love your ideas. Thanks Jonita, that’s actually the bottom of an old onion crate, but you could definitely make one and it would be a super easy DIY! Hmmmm….maybe a good post idea! 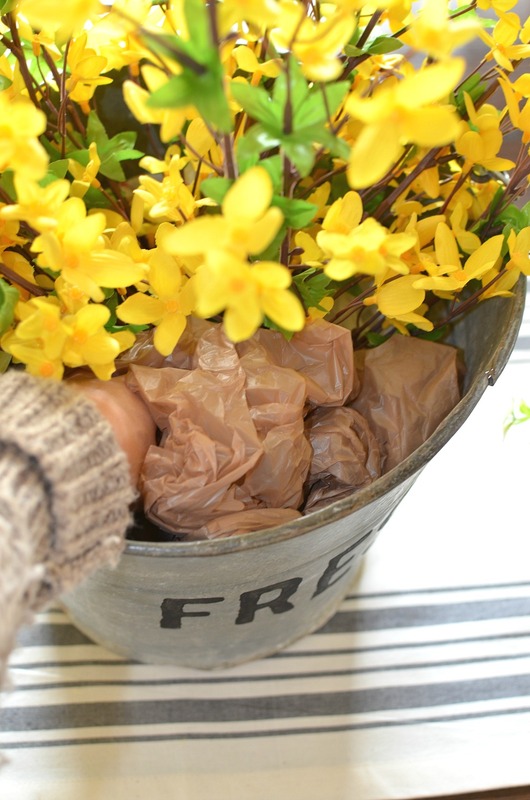 Hey Sarah…I love the vintage bucket of flowers. Those flowers are one of my favorite. Now I can brighten up my dining room table. Thanks. ???? I have a question about some bedding for my master bedroom. Would it be ok if I emailed ya…? Of course, anytime Ann! My email is [email protected]. I’m enjoying your blog. Thank you for sharing your ideas, its something I look forward to. Aw well thank you for coming by Terry! The bags are such a perfect idea! I will try that. For years, I have wadded up tin foil and stuffed it into buckets, tins, pitchers or wooden boxes, to raise the contents to show case them better, sometimes just to raise an object or two in the whole display. You can use it over and over again! I have also used scrap blocks of 2 x 4’s or 1 x4’s up on cabinet tops to raise things I’m displaying. Love your blog. 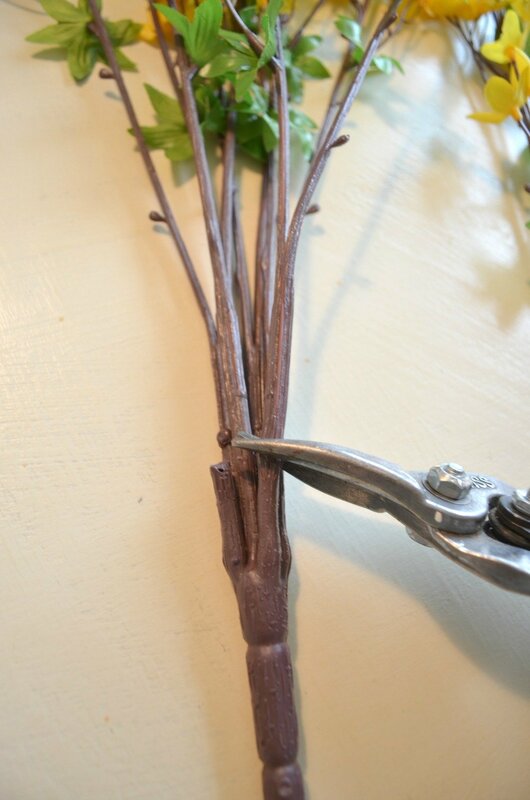 Also, your idea about cutting off the stems- ingenious. I’m always trying to bend and stuff that huge stem into things, and lamenting the fact I can’t buy more to fill things out. Excellent idea. Thanks! That’s a great idea with the blocks Elle! I’ve used plastic tupperware containers to do the same thing in the past, but blocks would be a much better idea. So glad you dropped by and enjoyed the post! 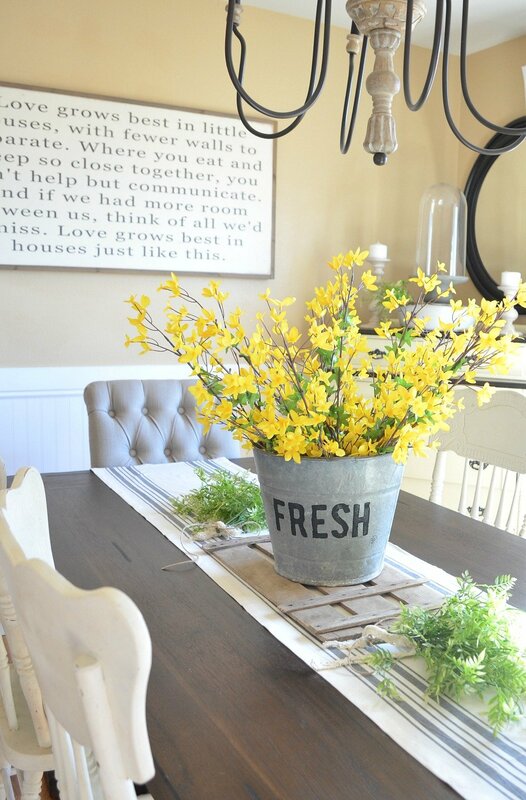 What a great idea to paint “fresh” on the bucket…adorable! Such a sweet idea! 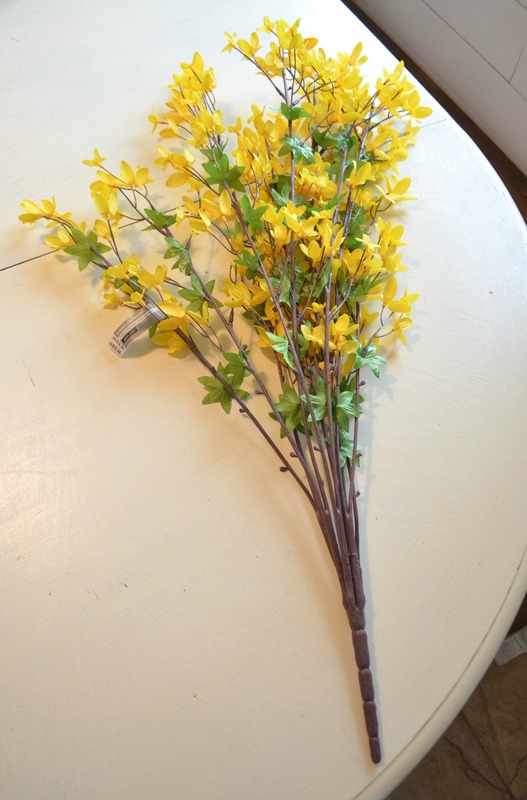 Forsythias are so pretty! Aren’t they pretty Vicki?? I think they are my favorite right now! I found these at Michael’s. Love all your ideas! I have just the bucket. Oh awesome, I hope you give it a try Sandy! I’ve got bags in my centerpiece vessel right now! I thought I was the only one! I must say, it is a brilliant idea. Ha, we are kindred spirits Laurie! You are a genius! Never thought to do this! No more buying 5 of those expensive bundles of flowers! Another great post! Thanks Sarah! ???? So glad you liked the post Mikaela! Thanks for dropping by! 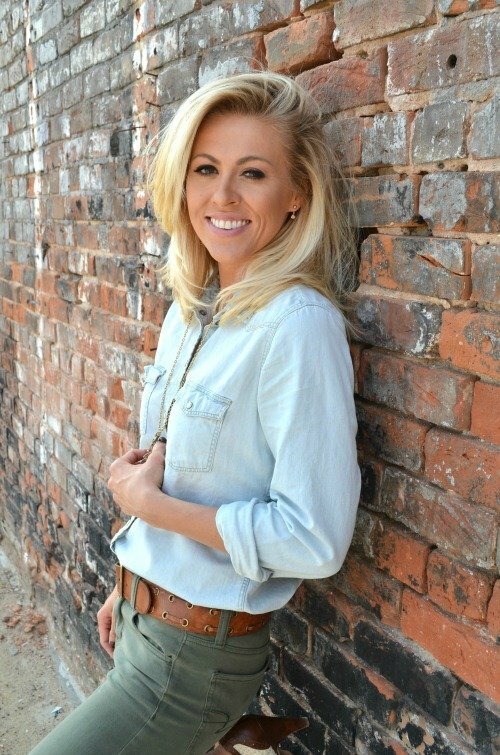 I really enjoy your blog!! I have used the “plastic bag trick” at Christmas when I put poinsettias in my crocks. High five Mary, those bags make such an easy fix! So adorable!!! I love how this turned out. I can’t WAIT for Spring! !